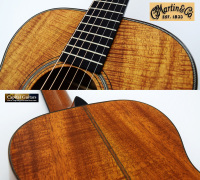 Offered for your consideration is this lovely Martin Custom 00-14 fret Koa beauty. 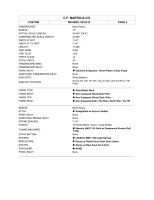 Koa instruments are among favorite guitars. 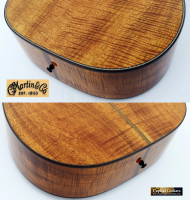 To my eye, Koa is among the prettiest of tone woods and it is a relatively sustainable species. 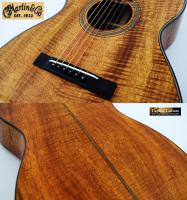 I also think that Koa has a voice that is the perfect compromise between the warmth of Mahogany and the clarity of Rosewood. 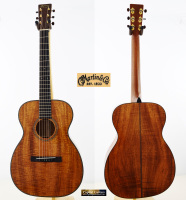 In addition to it's lovely figured Koa body, the specs of this lovely instrument include: a short (24.9") string scale; 1/4" scalloped Sitka top braces in Martin's 12A pattern; Madagascar Rosewood binding; fine herringbone purfling; a simple, 18-series style herringbone rosette; a Madagascar Rosewood endpiece; a 14 fret, quarter-sawn Mahogany neck with Martin's Modified V shape and a 2-way adjustable truss rod; a Black Ebony fretboard with a 16" radius, and blue Paua diamond and squares fingerboard inlays and a 1-3/4" bone nut; a square tapered headstock with a Madagascar Rosewood overlay and gold Waverly tuners with Snakewood buttons; a straight style Black Ebony bridge with a bone drop-in saddle and 2-1/4" string spacing; and Ebony bridge and end pins with Paua pearl dots. The body is finished in gloss and the neck in satin. While certainly a lovely instrument to behold, it is even nicer to play and hear. 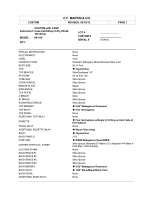 Please check out the brief sound sample included below. I think the tone is superb - not too warm nor too bright and perfect for an intimate couch buddy instrument. 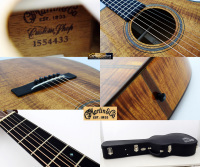 This guitar plays almost effortlessly and is setup with light gauge Elixirs and 12th fret string heights of 5/64" on the low E side and 4/64" on the high E side. 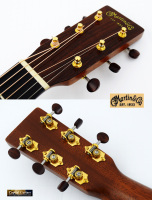 Built in Martin's Custom Shop in early 2012, this guitar is in superb condition. About the only flaws are a couple of tiny impressions on the top which are shown in the included photos. To see these impressions with the naked eye you will have to tilt the guitar to just the right angle under intense lighting and even then they are hard to find. 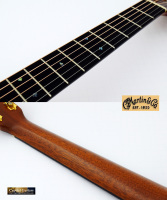 The frets are in fabulous condition showing no observeable wear. 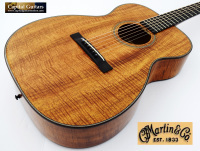 The guitar comes in it's original Martin Custom Shop case with the protective shroud and the detailed specifications from Martin. It would cost almost $7K to commission an instrument like this one today. 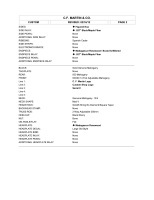 Alternatively, get this lightly played 2012 example for more than $2K less. 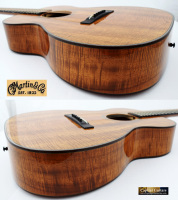 A lovely and relatively unique small bodied, short scale instrument from the craftsmen at Martin. Make it yours.